Residents of Baleswar in Assam's Nalbari district of Assam boast that they never witness any power cuts like big cities and towns as solar energy power their households. A farmer named Ainul Hussain has bought a computer for his son in a remote tiny village-island of Baleswar in Assam's Nalbari district, which has a population of around 1,500. Officially, there is no electricity in the region but villagers have taken a step to uplift their standard of living by introducing solar panels in their households. "We have to be careful with its usage, because it needs a lot of energy to run. My son operates it and it is for him that I bought it," he said. "These panels are available in Nalbari, but I bought mine from Guwahati. I had to shell out about Rs 10,000, which is a large amount for a simple man like me, but our quality of life has improved. So it's all worth it," explained Hussain in an IANS report. "For instance, the panel that I have generates enough power through the day to charge the battery, which will in turn run a light and a fan, which is my requirement. It can also charge my mobile phone. The panel has 35 small, circular solar plates and cost me around Rs 4,000," said Rekibul Rahman, one of the island dwellers who runs a tailoring shop. As many as 70 per cent of homes in Baleswar have solar panels. This is something that we city dwellers should learn as solar energy is clean and we really need to clean the air we breathe. 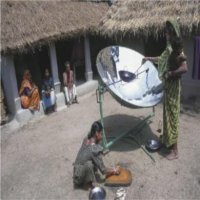 The IANS report further stated that the Assam Energy Development Agency (AEDA) has been promoting non-conventional energy sources like solar, wind and biomass for industrial and domestic use, especially in remote rural, hilly and border areas which are connected to the conventional grid.